Jay Conradi: A UMD grad earning a Masters in Fine Arts with a minor in journalism, Jay worked in the construction trade before focusing on his own trade as a studio artist turning and carving wood. His bowls and vessels are made of box elder, ash, birch, walnut, oak, and pine. His 40 years of wood working has progressed with the addition of wood-burned designs, dyes, and sandblasted decoration. A member of two wood turning clubs, Jay continues to study with master turners. Chuck Sjodin: Chuck's occupation as a carpenter, cabinet maker, and contractor for renovation projects keeps him busy, but his artistic talents are also obvious when he turns a wood bowl or platter. He works in cherry, birch, ash burl, elm burl, and birds-eye maple, sometimes leaving the natural raw characteristics of the wood untouched. His turned and carved work also includes unique table and bench pieces. Chuck has contributed how-to articles for the magazine "Fine Homebuilding". John Anderson: A graduate in fine arts from Drake University, John has worked in sales, design, and as a fine art gallery owner in Minneapolis before moving to the shores of Lake Superior and taking the time to create his own art. Inspired by the lake, his wall pieces are two-dimensional mixed-media works usually with landscape imagery on wood with the inclusion of found objects. Shelley Getten: Shelley finds inspiration for her art in the natural world – the quiet forest, bodies of water, and creatures of every kind. She has been creating block print art since 2003. She was commissioned to create 36 birds to be used on posters for the Elizabeth Fries Ellet Interpretive Trail (Eden Prairie). The art form truly lent itself to the creation of these “feathered friends”, and she has continued to produce birds as well as other wildlife, amphibians, and North Shore inspired scenes. Michael Tonder: The familiar and widely recognized glass sculpture by Michael has been awarded for it's innovative approach. The work is created from recycled glass, hand-cut and assembled, fired to over 1400 degrees, and then carved and etched with a sandblaster. The completed works are inspired by his time as a forester and park manager, and years of observing the seasonal changes in Northern Minnesota. Scenes of transition and times of change are constant inspirations to his work. his work is included in private collections worldwide. Jody Tonder: Jody creates jewelry and ornaments from 95% post-consumer recycled glass. The pieces might be made from scrap glass at stained glass studios, bottles from recycling centers, or drinking glasses, cups or plates from garage sales. Each piece of glass is selected for color or texture, hand-cut, and either kiln-fired to a shiny surface or etched to a beach-glass texture. 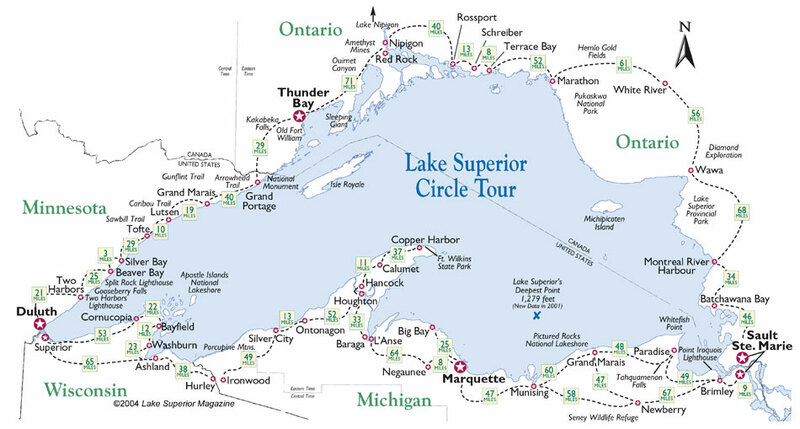 The Lake Superior Circle Tour in northern Minnesota (highway 61) These highways are usually the closest to the lake.